The Miami Leadership Dialogues provide an opportunity for speakers to share their perspective on the current state and future opportunities for Miami. Speakers are recognized community leaders from business, government and civic organizations, who also use the opportunity to field questions from community members. This event is presented in partnership with FIU External Relations and the FIU Office of the President. Alberto M. Carvalho, Superintendent of Miami-Dade County Public Schools (M-DCPS). 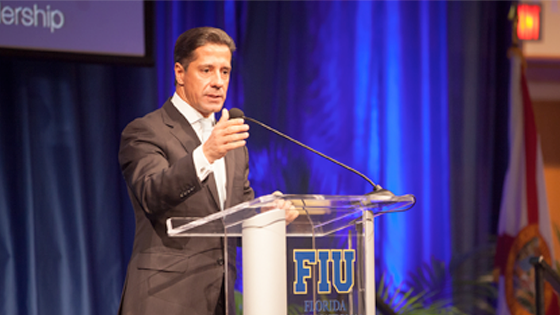 Alberto Carvalho has served as Superintendent of Miami-Dade County Public Schools, the nation's fourth largest school system, since September 2008. He is a nationally recognized expert on education transformation and finance who has successfully elevated his district's academic profile and streamlined its business operations and financial systems. Now widely considered one of the nation's highest-performing urban school systems, M-DCPS was named as the 2014 College Board Advanced Placement Equity and Excellence District of the Year, as well as the 2012 winner of the Broad Prize for Urban Education. A versatile leader, Carvalho is also the self-appointed principal of two award-winning schools: the Primary Learning Center and the iPrep Academy, and has served as President of the Association of Latino Administrators and Superintendents. He has been selected as Florida's 2014 Superintendent of the Year, as well as the 2014 National Superintendent of the Year and was recently named by Scholastic Administrator as one of "The Fantastic Five" educators making a difference in America. Mr. Carvalho has been awarded of a number of honorary degrees including a Doctor of Public Service by Florida International University; Doctor of Humane Letters by both Barry University and Florida Memorial University; and a Doctor of Pedagogy, Honoris Causa from Nova Southeastern University. He has been honored by the President of Portugal with the Ordem do Mérito and by Mexico with the Ohtli Award, the highest award for a civilian living outside of Mexico. Mr. Carvalho has been featured on CNN, NBC, and ABC and in publications such as The New York Times, The Wall Street Journal, District Administration Magazine, and The Christian Science Monitor.